Joyous Celebration 20 Part 2: The Alumni Live in Durban at The Moses Mabhida Stadium (2016). This beautiful album has 24 wonderful songs of praise and worship. 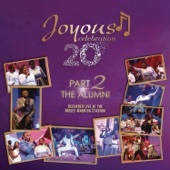 It has become normal for Joyous not to disappoint, even in this Joyous Celebration 20 part 2, they did not disappoint and the proof, as they say, is indeed in the pudding.